The popular Riverside bar Prohibition had a controversial birth, and it left a lingering scar or two that's lingered in a feud between former partners, and which threatened to return to a boil this summer when Joey McGuirk, the bar's onetime manager, published a letter (see below and here) his lawyer sent to Prohibition's co-owner Michael Summerfield, detailing the messy sundering of their relationship. 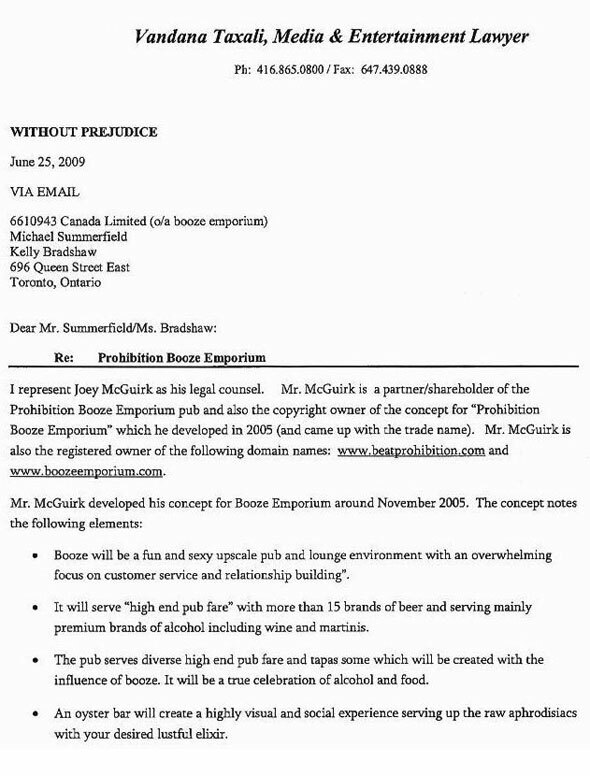 Flash back two years, to the other letter Summerfield, McGuirk and co-owner Kelly Bradshaw received from the Alcohol and Gaming Commission of Ontario, telling them that the name of their new bar, Booze Emporium, wouldn't fly. "They thought that it promoted the sale of alcohol," recalls McGuirk, "and I said that's exactly what we're trying to do - you guys do it all the time. Didn't work, though." 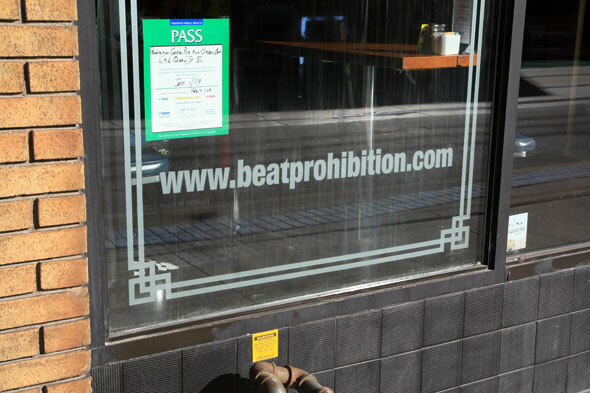 Summerfield wanted to change the name to Prohibition, but McGuirk suggested that they paste it over the old name on their signage as a subtle nose-thumbing to the powers that be. Looking back, Summerfield is at pains to be circumspect. "It's a self-governing body so I'm not going to say anything negative about it. This is my livelihood, so it was what it was, and I dealt with it. People can use their imagination as to how I felt about it. I'm certainly not going to say anything negative about the Alcohol and Gaming Commission." 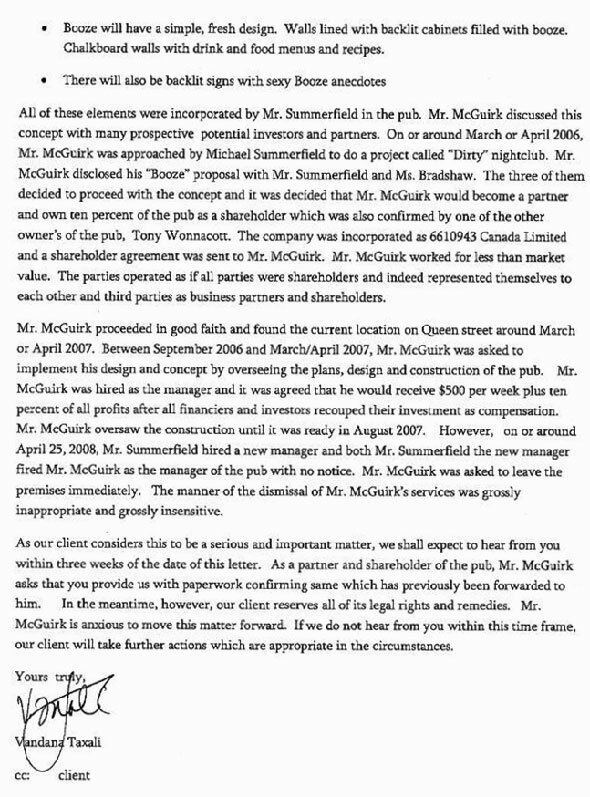 Fast forward to spring of 2008, and the day - detailed in the lawyer's letter McGuirk has published on the bar's old website (Still promoted in signage at the bar - see above - even though Summerfield has since created a new web site for the bar at prohibitiongastrohouse.com) - that McGuirk found himself replaced as manager and pushed out by his partners. In the letter, he claims that the bar's concept was his own creation, and demands acknowledgement of his role from his former partners. Establishing intellectual property in the restaurant world is, however, easier said than done. "If somebody else opens a place and it has similar stuff but a different name, I doubt if I'd be able to go after them," McGuirk says. "First of all, I wouldn't go after them because that's what the business is about - no one's reinventing the wheel here, you know what I mean?" Still, he says, the context here is their former partnership, and his role in it. Summerfield insists that he has nothing to say about the case. "He has his story and I have mine. It's not even worth commenting on - the people who know the facts know the facts. I wish Joey all the best in what he's trying to do. Your best bet is to call his lawyer and find out if she knows that her letter is up on that site." After posting the letter this summer, however, McGuirk says that he's content to leave the matter with his lawyers, and concentrate his focus on Oh Boy!, the burger bar he's opening this month on Queen West near Portland. "Still, at the end of the day, a fantastic apology would probably make it all go away," McGuirk tells me. "But I won't hold my breath for it."